The first stage of translation is the binding of tRNA molecules to their appropriate amino acids. When linked to its amino acid, a tRNA delivers that amino acid to the ribo-some, where the tRNA's anticodon pairs with a codon on mRNA. 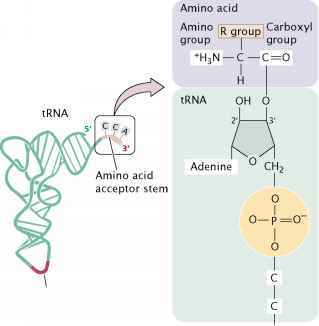 This process enables the amino acids to be joined in the order specified by the mRNA. Proper translation, then, first requires the correct binding of tRNA and amino acid. As already mentioned, a cell typically possesses from 30 to 50 different tRNAs, and, collectively, these tRNAs are attached to the 20 different amino acids. Each tRNA is specific for a particular kind of amino acid. All tRNAs have the sequence CCA at the 3' end, and the carboxyl group (COO-) of the amino acid is attached to the 2'- or 3'-hydroxyl group of the adenine nucleotide at the end of the tRNA, (< Figure 15.16). If each tRNA is specific for a particular amino acid but all amino acids are attached to the same nucleotide (A) at the 3' end of a tRNA, how does a tRNA link up with its appropriate amino acid? 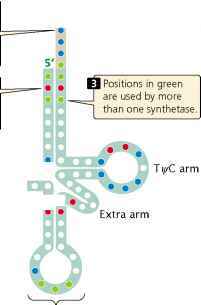 415.16 An amino acid attaches to the 3' end of a tRNA. The carboxyl group (COO-) of the amino acid attaches to the hydroxyl group of the 2'- or 3'- carbon atom of the final nucleotide at the 3' end of the tRNA, in which the base is always an adenine. | Positions in blue are the same in all tRNAs and cannot be used in differentiating among tRNAs. Positions in red are important in the recognition of tRNAs by one synthetase.